At readings I welcome the inevitable question: where do you get your ideas? My ideas come from musings, from observation, from memory; from reading, from travel, from movies, from anecdotes heard or overheard, faces on the subway and rooms seen through a window. They are invented and borrowed and stolen. Some particular interests of mine are inter-species liaisons; asexuals, who get scanted by writers; and accommodation – to circumstances, to personal limitations, to the claims of family, to place. I am slow. A sentence often takes an hour to compose before I throw it out. What can you do? My stories are rarely autobiographical, except in the Flaubertian sense that all characters from hero through villain to pet parrot c’est moi. 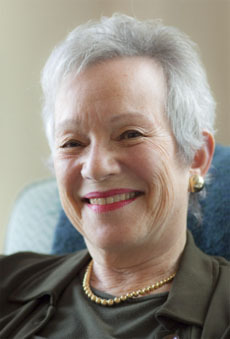 Edith Pearlman has published more than 250 works of short fiction and short non-fiction in national magazines, literary journals, anthologies, and on-line publications. Her work has appeared in Best American Short Stories, The O. Henry Prize Collection, New Stories from the South, and The Pushcart Prize Collection – Best of the Small Presses. Her first collection of stories, Vaquita, won the Drue Heinz Prize for Literature and was published by the University of Pittsburgh University Press in 1996. Her second, Love Among The Greats (Eastern Washington University Press, 2002) won the Spokane Annual Fiction Prize. Her third collection, How to Fall, was published by Sarabande Press in 2005 and won the Mary McCarthy Prize in Short Fiction. Her fourth collection, Binocular Vision: New and Selected Stories, was published in January 2011 by Lookout Books, a new imprint at the University of North Carolina Wilmington. Pearlman's short essays have appeared in The Atlantic Monthly, Smithsonian Magazine, Preservation, Yankee Magazine and Ascent. Her travel writing – about the Cotswolds, Budapest, Jerusalem, Paris, and Tokyo – has been published in the The New York Times and elsewhere. However she is a New Englander by birth and preference. She grew up in Providence, Rhode Island, and now lives with her husband in Brookline, Massachusetts. She has two grown children and a grandson. Edith Pearlman has worked in a computer firm and a soup kitchen and has served in Brookline's Town Meeting. Her hobbies are reading, walking, and matchmaking.